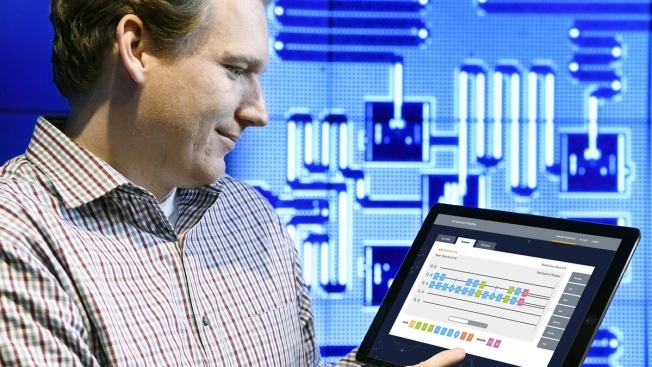 In this file photo taken by Feature Photo Service for IBM, quantum computing scientist Jay Gambetta uses a tablet to interact with the IBM Quantum Experience, the world's first quantum computing platform delivered via the IBM Cloud at the T. J. Watson Research Center in Yorktown, NY. IBM has announced a milestone in its race against Google and other big tech firms to build a powerful quantum computer. Dario Gil, who leads IBM's quantum computing and artificial intelligence research division, said Friday that the company's scientists have successfully built and measured a processor prototype with 50 quantum bits, known as qubits. Gil says it's the first time any company has built a quantum computer at this scale. Quantum computing, a technology that's still in its early phases, uses the quirks of quantum physics to perform calculations at far higher speeds than current computers. Seth Lloyd, an MIT mechanical engineering professor not involved in IBM's research, says it's likely that IBM still has glitches to work out but the 50-qubit announcement is a sign of significant progress.